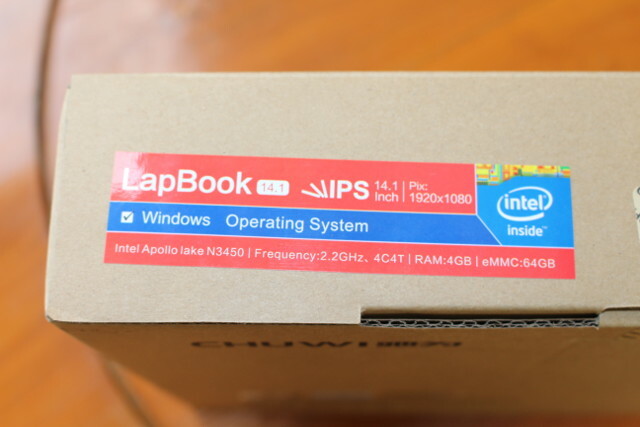 CHUWI LapBook 14.1 is one the first Intel Apollo Lake laptop launched in the market. It features an Intel Celeron N3450 quad core processor coupled with 4GB RAM and 64GB storage, and comes with a 14.1″ Full HD IPS Display. The company sent me a sample for review, and I’ll start by checking out the hardware today, before running some tests in Windows 10, and trying to install Ubuntu 16.04 later on. but a sticker on the stop made it clear which model I got. 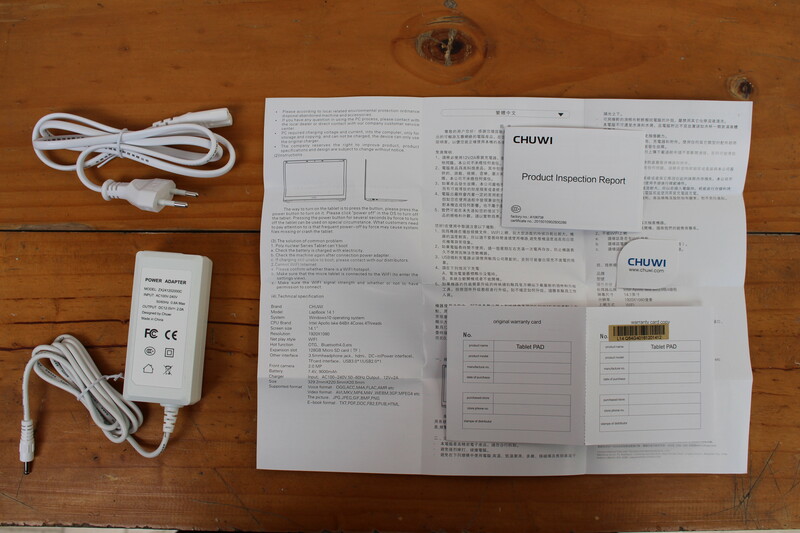 The laptop comes with a 12V/2A power supply and power cord, a user manual in English and Chinese, a warranty card, and a product inspection report. The laptop battery is nearly fully charged, so I started it. 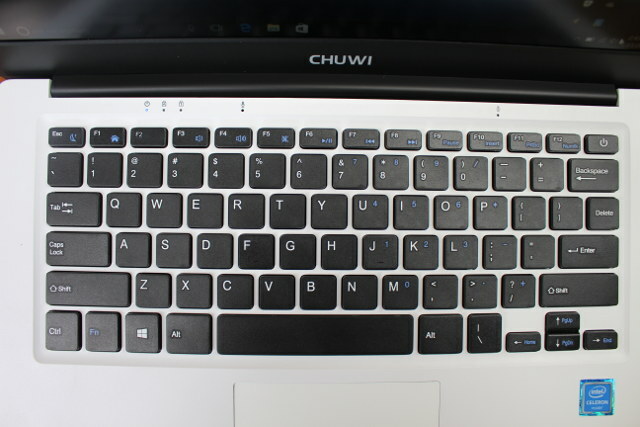 I could not find any keys to adjust the display brightness, but maybe I’m supposed to do that in Windows. It’s been close to 5 years since I’ve used a Windows laptop, and that was a Windows XP netbook, so I may have a few things to learn before the review. The device is very thin, and quite light (1.5 kg). One of the side comes with the power jack, a USB 3.0 port, a mini HDMI output, while the others features a micro SD slot, a headphone jack, and a USB 2.0 port. The laptop is clearly not designed to be user serviced, especially since there’s no upgrade possible. 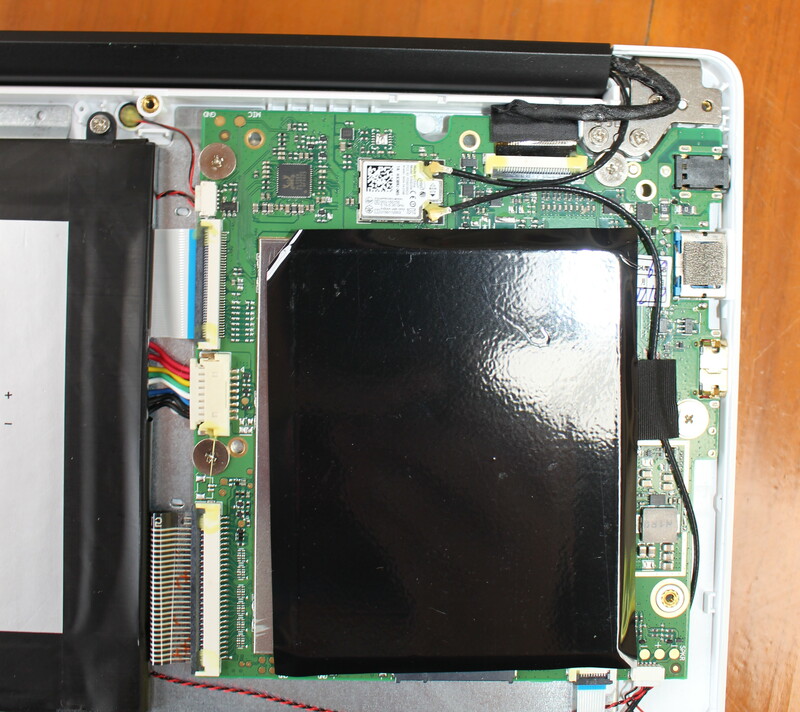 We’ll have to start on the back of the laptop, model CWI533, and loosen 10 screws to open it up. It won’t open that easily, and I have to use a plastic tool to unclip the bottom cover. I have never open this type of thin laptop before, and the battery takes a lot of space, simply because it has to be so thin. We’ll also find two speakers on each side, and two WiFi antenna placed at opposite location in the laptop. The main board components are covered by a metal shield and black thermal sheet, except for the audio chip and Intel Dual band Wireless-AC3165 (3165D2W) WiFi module. 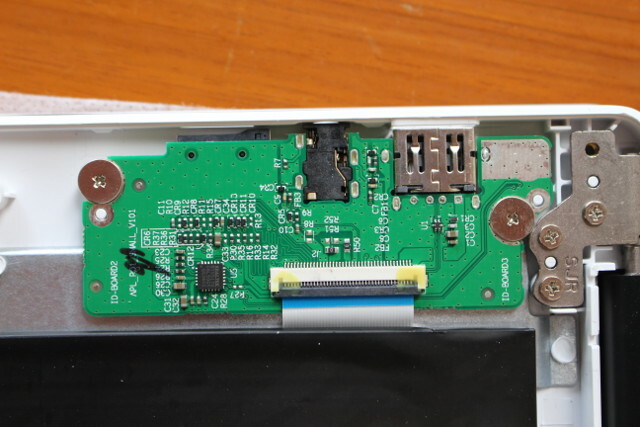 We can also see a connector to add a M.2 SSD on the bottom center of the board. 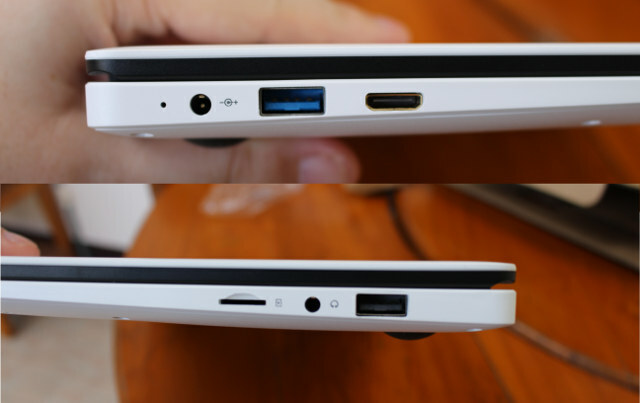 On the other we have IO-BOARD2 with the micro SD slot, audio jack, and USB 2.0 port. 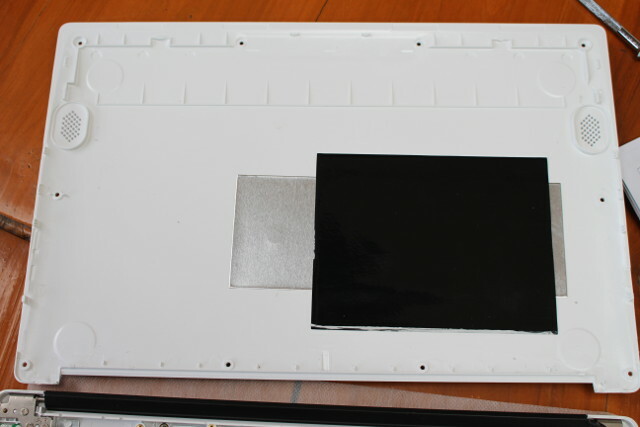 Black thermal & metal sheets can also be found on the bottom cover of the laptop. 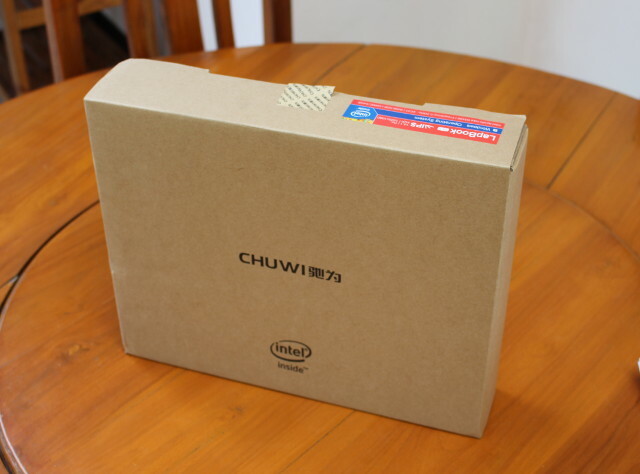 I’d like to thank CHUWI for providing a review sample. The laptop is not for sale but GearBest and Banggood have it listed with an arrival notice with price starting at $269.99. You may find a few more details in the manufacturer website. In the second part of the review, I’ll go through most of the test I do for Windows mini PCs, and do a battery test (any standard ones?). 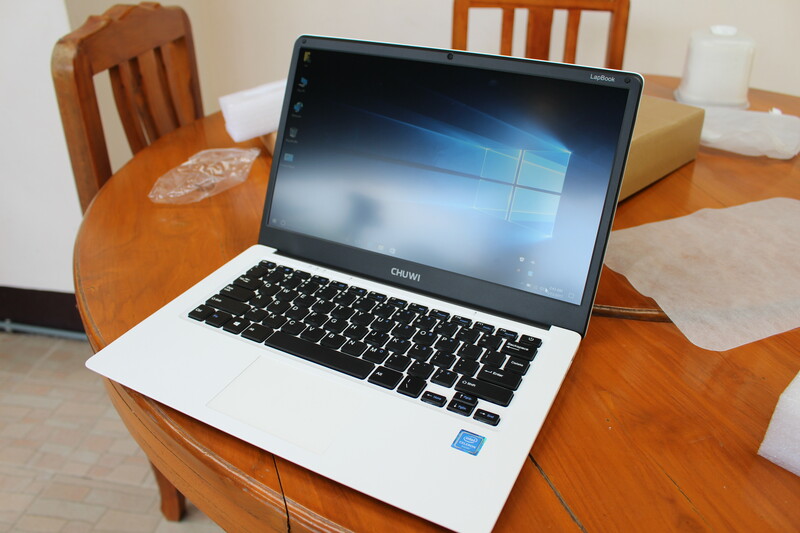 Continue reading “CHUWI LapBook 14.1 Apollo Lake Laptop Review – Part 2: Windows 10 Benchmarks, User Experience, and Battery Life“. Too bad they didn’t put the DC-in jack on a daughter board. It’s going to mean a whole new laptop if someone trips over the power cable. DC jack repairs are never as good as the original and never last long. They could have moved the DC jack over to the right hand side (on the same board as USB 2/Audio/uSD) and then you would only need to replace the daughter board if you broke the jack. It would be nice to write something about possibilities to upgrade RAM and storage space on our own. These kinds of cheap laptops have the RAM and internal storage soldered into the motherboard to save space and production cost. You can expand it semi-permanently with a micro sd card. 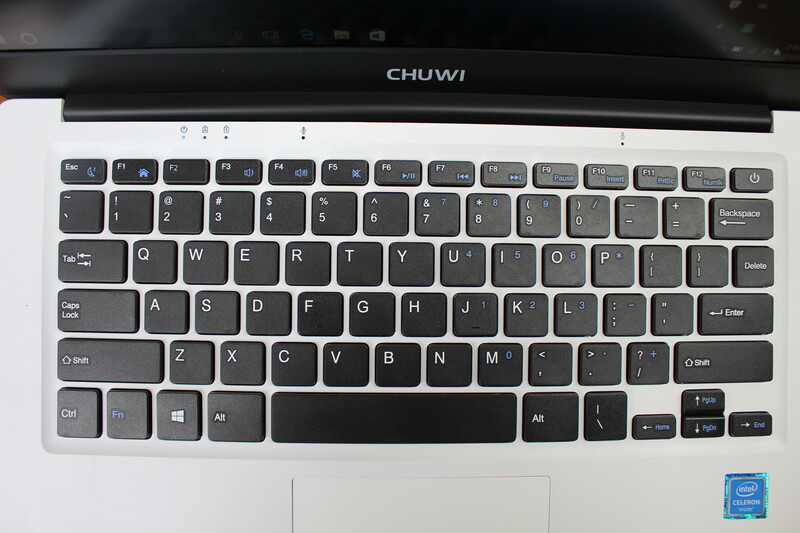 I have a Chuwi Hi8 Pro Cherry Trail tablet. Terrible device. Awful support. Misleading specs. Badly flawed BIOS+Battery interaction. Advertised as USB 3 over USB C. It wasn’t. It was USB 2 over USB C and didn’t properly follow USB C power protocols so you can’t charge it and connect peripherals at the same time. Boot it with a uSD card in the slot? Half the screen flashes continuously until you take it in and out of standby. AND worse of all – loads of them were bricked by poor BIOS / Battery integration meaning the battery level indication in Windows is incorrect (overestimating battery life causing the tablet to die with no warning as the battery goes flat) and then in some cases failing to allow it to be recharged. I’d NEVER buy another Chuwi device. Is a metal bar next the touchpad for earn weight? But as @KopiJahe mentioned RAM and storage are soldered on the mainboard, so the only really storage update is to use a micro SD card, or USB flash drive. Most probably. That’s done in order to avoid the laptop to fall over when the display is inclined. 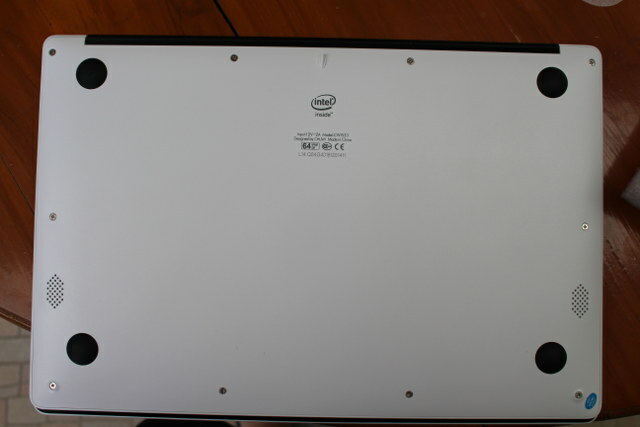 On the right side of the board, on the bottom side of the black thermal sheet, there is a slot for a M.2 SSD. Quite usefull! On Youtube there’s a video showing it. Yes, that right. I forgot to mention that there’s a connector on the bottom of the main board… We can see it on the photo too. I’ve disabled Sleep on battery and power (Set to Never), but for some reasons the laptop will sleep after a while when running PCMark 8. It does not sleep with other programs.. I also have problems with USB flash drives, some are not recognized at all.